JH: Please help me welcome Zara Quentin to the lecture hall today, to share her thoughts and process on world-building. She's lived in France, London, and Auckland, New Zealand. She is always determined to fit in as much travel as possible. She now resides in Melbourne, Australia with her husband and three children. She is currently working on the next installment in the Airwoman series. 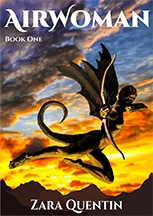 You can get a free preview of Airwoman by signing up to her email list at www.zaraquentin.com. I love world-building. It’s one of the things I enjoy most about writing fantasy. Creating amazing and crazy settings for the adventures of my characters really lights up my imagination. In real life, I love to travel, to experience being somewhere new and different. Though setting is only the background to life and culture, places do have a feel about them. Almost as though they have a personality of their own. I also enjoy large scale, epic movies—think Avatar or Lord of the Rings. The detail of the world-building—the background to the story—is beautiful, deliberate and rich enough to make you believe.Think about the Harry Potter franchise—both the books and the movies had the effect of drawing readers (or movie-goers) into the wizarding world for a magical experience. It is the quality of the world-building that makes readers want to go and live in the world JK Rowling created. That effect is what you’re aiming for too. Often when people talk about world-building, they come up with lengthy questionnaires. The idea is that the author needs to know more than anyone else about the world of the story and how it works. Such questionnaires usually have endless detail including questions that go to the social and political structure, how commerce is transacted, the religion, myths, what people do to make a living—the list goes on. That’s all fine, but how do you decide on the answers to these questions? And most importantly—why? I’ve tried questionnaires, but none of them help me to make the world more real. None of them help me to understand or to make it more logical and believable. They certainly don’t add to the experience. I think the reason is that most questionnaires deal with world-building as being separate from character and plot. To bind a story together, your setting—your world—has to evolve in tandem with character and plot. Where many people go wrong with world-building, I think, is to try to make it cool and amazing, without having an idea of why the world would become that way. They are busy thinking about the what, without wondering about the why. I also like to watch nature documentaries, especially the ones narrated by Sir David Attenborourgh. Not only do I find them interesting and beautifully filmed, but I also get plenty of world-building ideas (truth is often stranger than fiction, after all). Often as you watch, the narrator is giving tons of information about why an animal is acting in a particular way. Usually, it is because of the animal’s reaction to their environment—their world. Animals have evolved to best survive on their patch of Earth--to adapt to their environment, to defend themselves against prey, to prey on other animals, to find food or to attract quality mates. Those that adapt best win the race of survival. Those that don’t, lose. These documentaries may not always have all the answers—scientists are discovering new things every day, after all. However, they almost always ask the questions—they make an attempt to get to the why. With your fiction, you have to do that too. When building a fictional world from scratch, it is easy to fall into the trap of creating something weird just because it’s different and cool. I think the questionnaire approach can feed into this habit because makes it seem like a process which is separate from character and plot. Instead of using a questionnaire, I ask myself some really basic questions: Why? How? Usually, I would start with my initial idea. Was it a character idea? Start there. What are the defining characteristics—physical or habitual—of the main character and their race? Why do they have these defining characteristics? Is it a defence against attack? Or a sign of status? Where do they live and why? What do they do for a living and why? How do they live? How do they survive? Maybe you started out with a plot idea? Start there instead. What type of people would be most motivated to pursue the goal of the plot in question? Why? What is their particular need? Why do they need it? How can they pursue that need? Yes, these are all still questions, but they evolve from the character and plot, rather than being external to it. Let me illustrate by using my own process as an example. Airwoman is a portal fantasy—my universe (“Dragonverse”) contains natural portals that lead from one world to the next. The only race of people who can access these portals are called Travelers. Why would Jade have wings? How did she get from that other place to here? These answers to these two questions fed into each other—the portals became naturally occurring features because the characters who can traverse these portals can fly. It makes sense, then, that the portals would be in the air and positioned in such a way that ordinary (land bound) people can’t just stumble on them. So the answer to why Jade would have wings could be twofold—perhaps it is because it was the best survival mechanism against predators or because their environment was best suited to wings. Or it may be because their kind was intended—created—to cross between worlds through the Portals. This answer, of course, sparked a new question which goes to their religion: Why were they created? Who created them? Perhaps Jade’s people believe that they are created in their god’s image. Of course, people with wings and tails would likely have a very different conception of what their gods look like. These answers help to flesh out the details of their religion. Answers led to other questions, which developed the world further and informed the culture of the people in the story. For example, a person with wings has a defining physical difference to a human-being. It would naturally affect the way they live, dress and behave. Why? Well, they have wings sprouting from their shoulder-blades, so that makes wearing traditionally tailored shirts difficult. Also, a tail makes it hard to find a pair of jeans to fit. Why wear shoes when you never walk anywhere? And sitting in chairs? Forget it. Why would you build your house on the ground if you can approach the doorway by air? Would you put your doorway in the roof? Or perhaps built your house high up? In a tree, perhaps? Or at the top of an otherwise inaccessible cliff? The Why Gives you the How…then you get to the What. I use this method to guide my world-building and then I find it starts to influence my plot choices too. I think it helps to make sure the everything is logical and connected. There’s nothing worse than reading a story set in a strange new world and feeling like it just doesn’t make sense. Perhaps the author has created a society where the people can read each other’s read minds, and yet they still speak. But if people don’t need to talk to each other, because they communicate via telepathy, why would they ever develop vocal chords? So, feel free to use the questionnaires, but ask yourself some basic questions first. Then when you’ve got an idea of the way your world works, then pick up a questionnaire to flesh out the details or make sure you haven’t forgotten something major. The most important thing to remember—first—is ask: why? How do you build your fictional worlds? Let me know, I’d love to hear from you in the comments. Meanwhile, Axel—her close friend and secret crush—disappears without a trace. Then Jade discovers the circumstances surrounding her father’s death are not what they seem— her uncle Zorman suspects foul play. To find the truth and avenge her father’s death, Jade travels to an uncharted world, where she will learn more about her family, herself, loyalty, and betrayal than she ever imagined. Great advice and insight into building fictional worlds. Why is definitely the biggest, and most important question. Thanks! You're absolutely right - "why" is definitely the most important question. I'm so glad you found it useful.